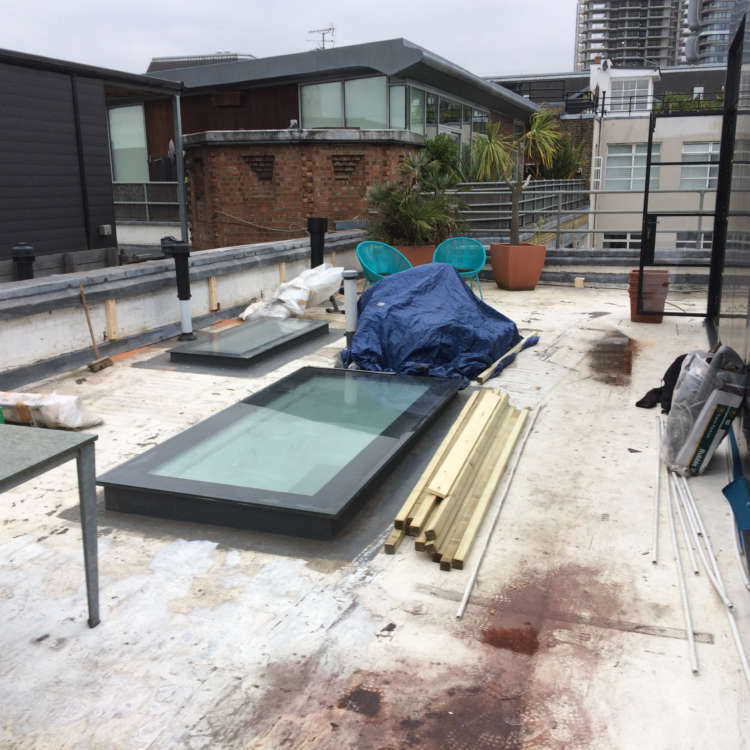 Our clients were undertaking the renovation and extension of their converted warehouse penthouse that included building a pavilion style extension in the space to form a bathroom and bedroom. 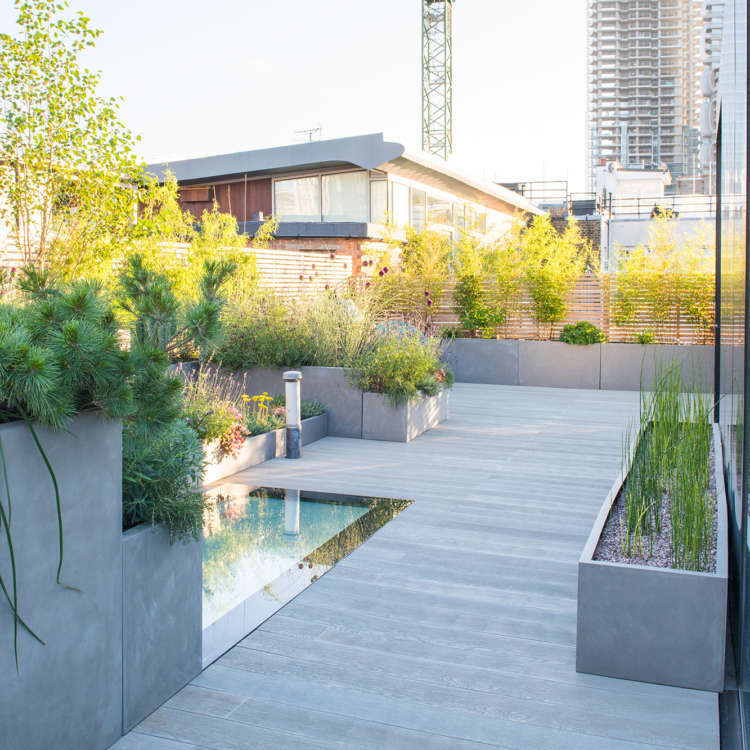 The extension is a fantastic architectural highlight of the property and our clients wanted a roof top garden space that would compliment the contemporary interior and flow with the architecture. 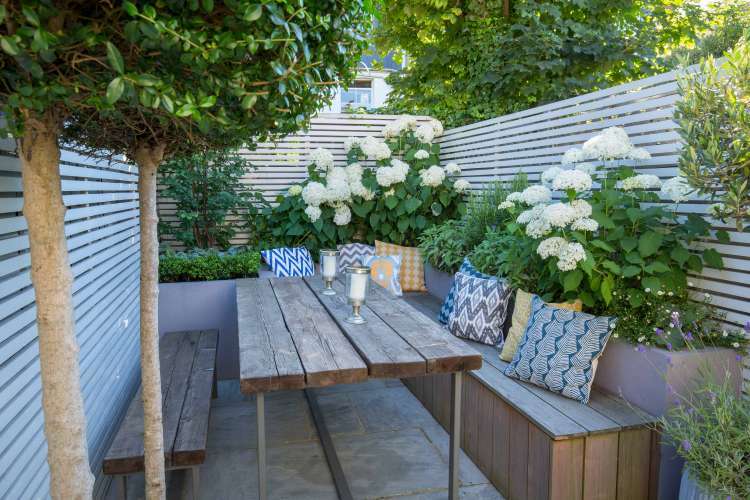 A dining, cooking, lounging area and privacy were all in the remit for transforming the wrap around space. 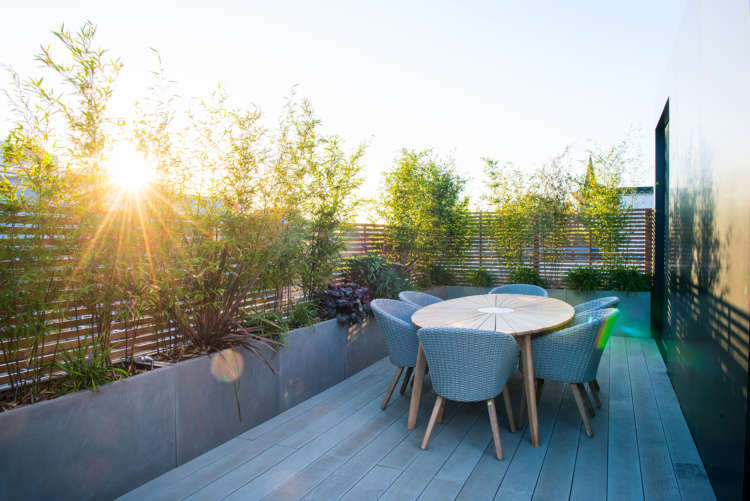 We used a pedestal and joist system to support an oak effect, non-slip ‘Millboard’ decking, with a light finish that flows effortlessly with the interior surfaces. 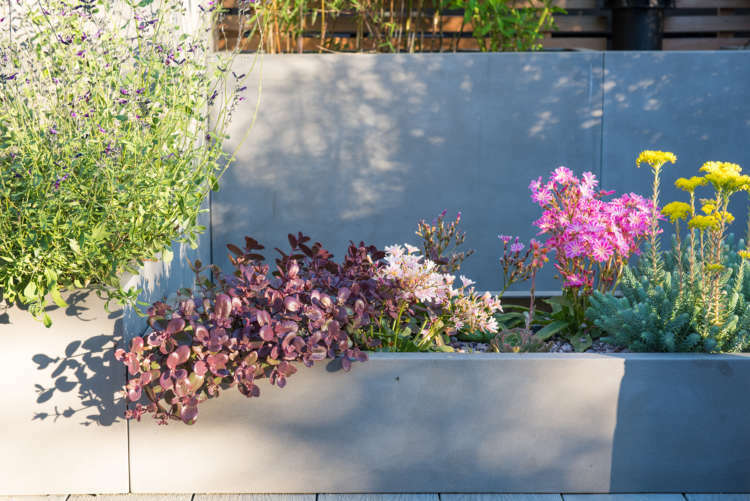 Working with our bespoke planter suppliers, we trialled a number of concrete-effect finishes in GRP (glass reinforced plastic), before selecting a finish that we were content with, to give a slightly industrial yet modern finish to the planters, contrasting against deep green foliage and a peppering of punchy flowers. 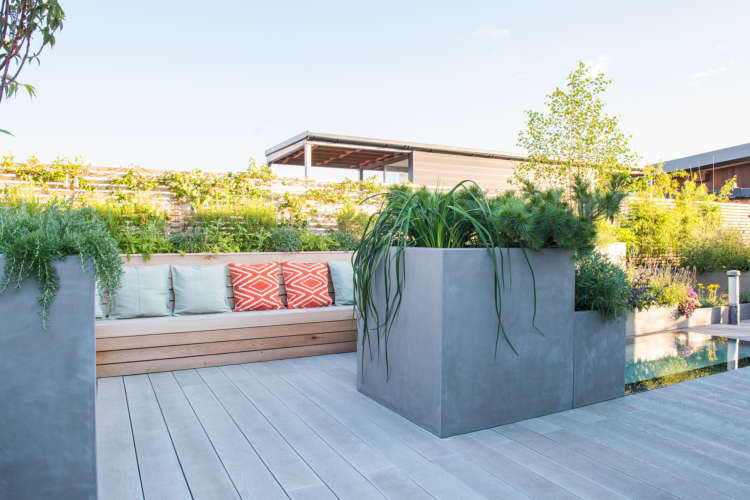 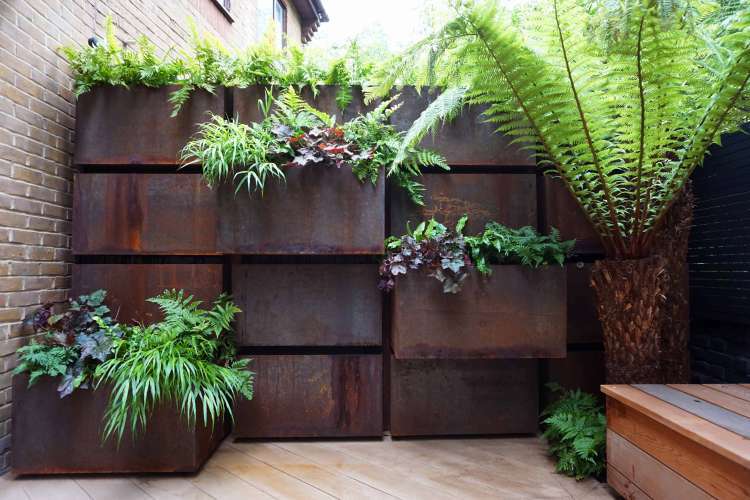 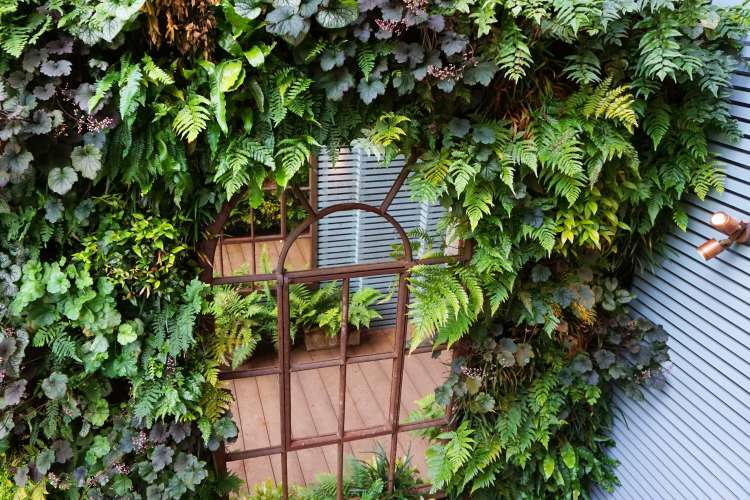 The planters were designed to hide various services on the roof at staggered depths and heights and to accommodate a range of plants that suit the various conditions around the three terrace areas. 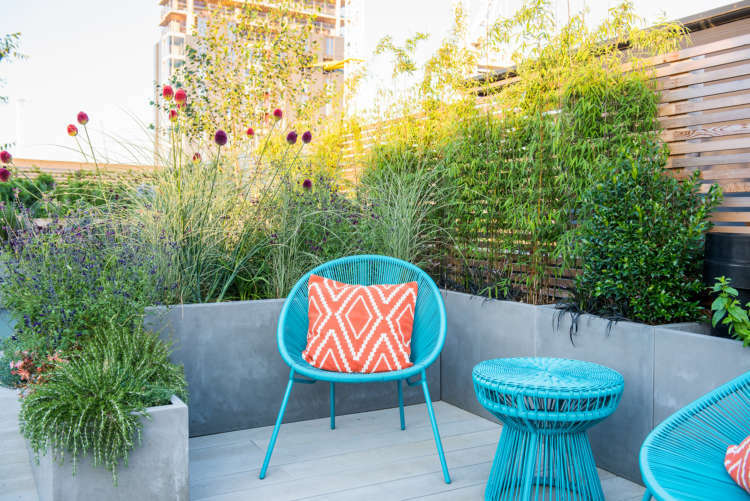 The three areas of this roof terrace now have slightly different atmospheres, whilst maintaining a consistent and contemporary look throughout. 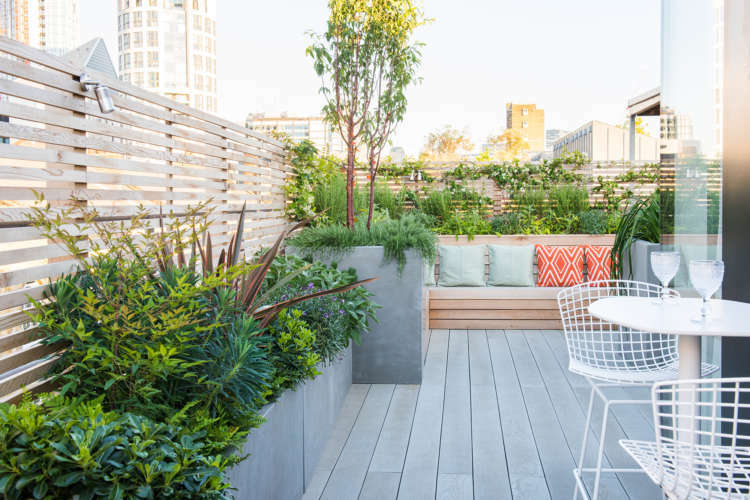 The seating areas feel secluded and cosy without losing the sense of place and rooftop atmosphere. 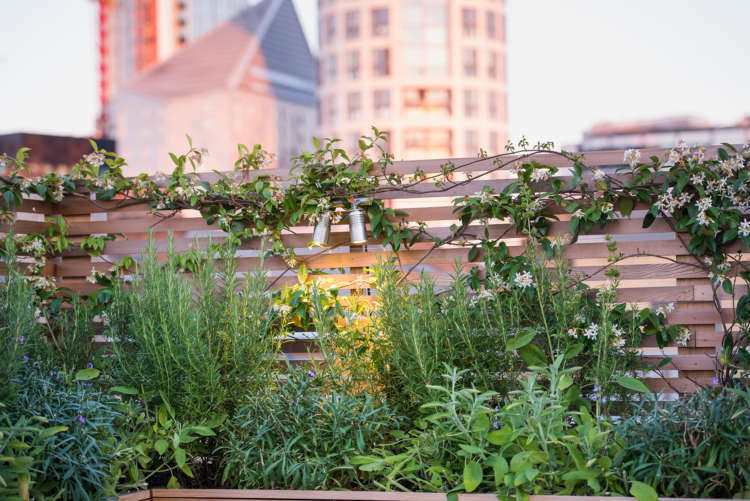 A range of plants and flowers provide year-round interest, including herbs for cooking outdoors. 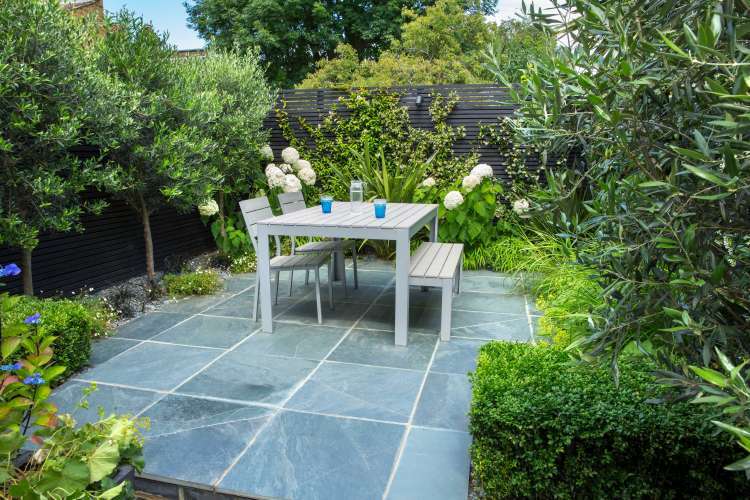 The hardwearing surfaces add character and depth to the space and will stand the test of time. 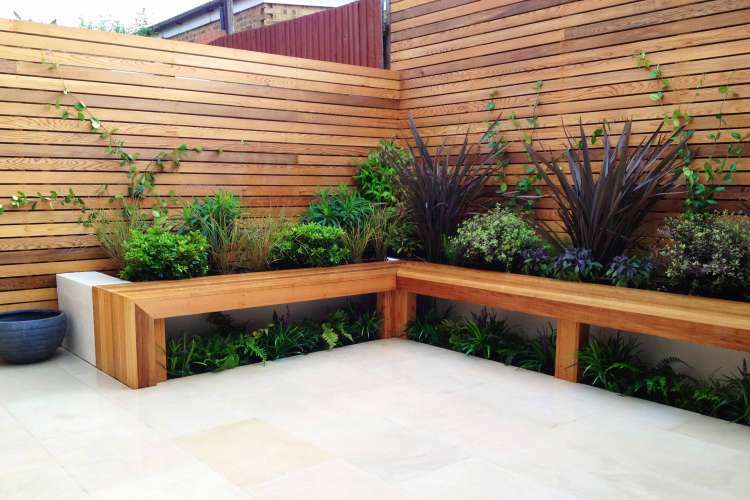 A very special space that is a valuable addition to the client’s property and lifestyle. 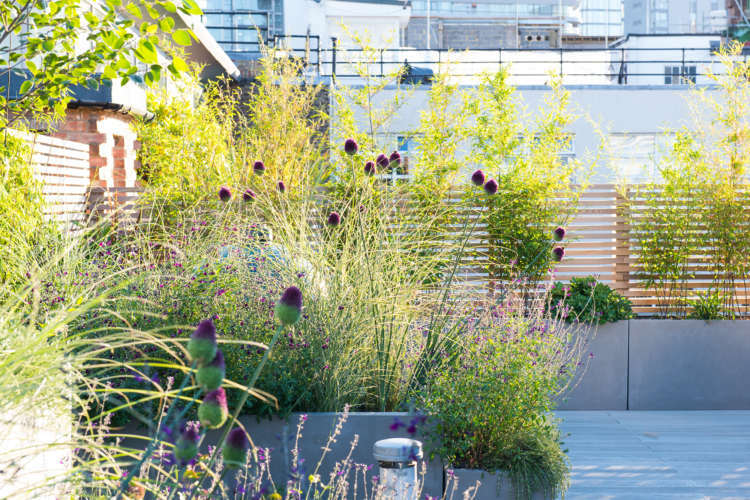 Garden Club London have done a fantastic job from the design stage, all the way through to the installation and maintenance of our roof garden (hardscaping, planting and lighting). 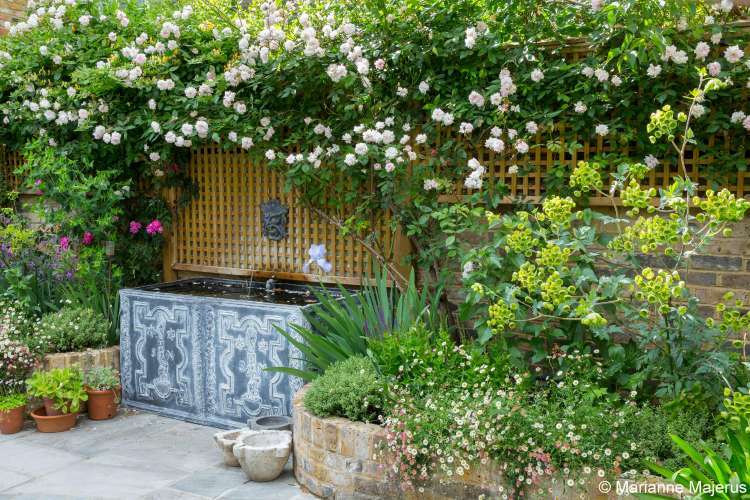 It’s totally transformed the way we use our home and we wish we had brought in Garden Club London much earlier. 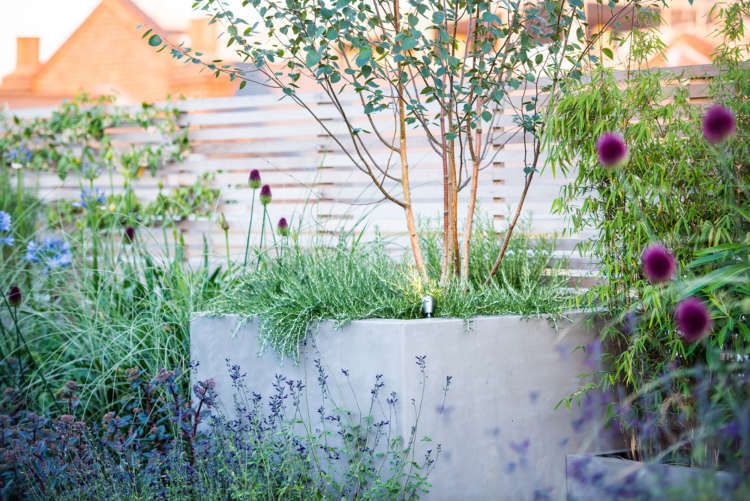 If you'd like to work with us, get in touch. 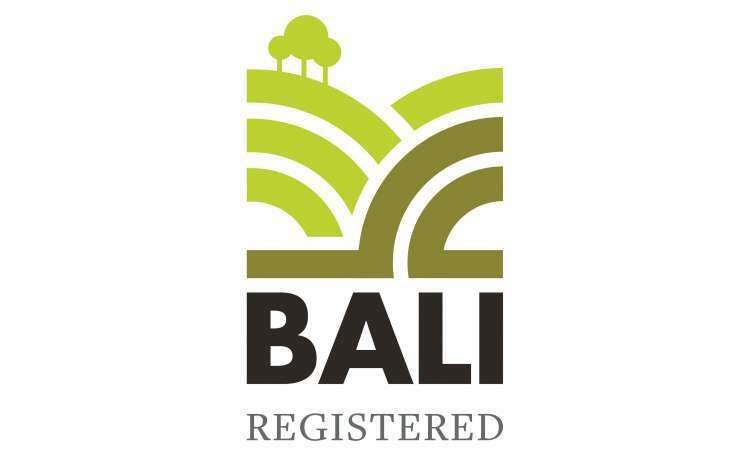 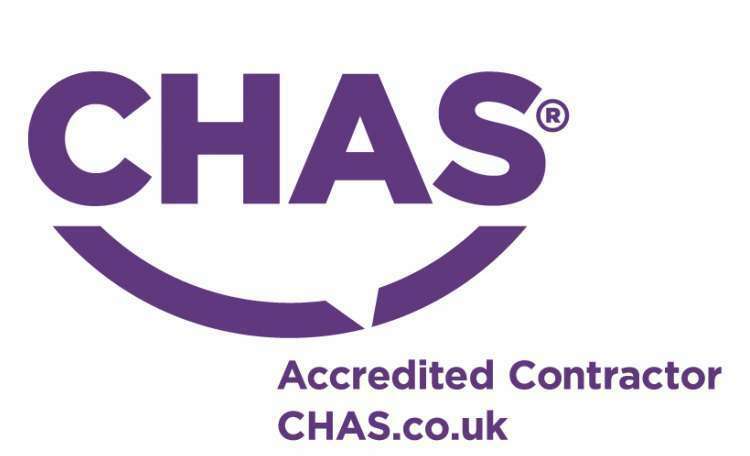 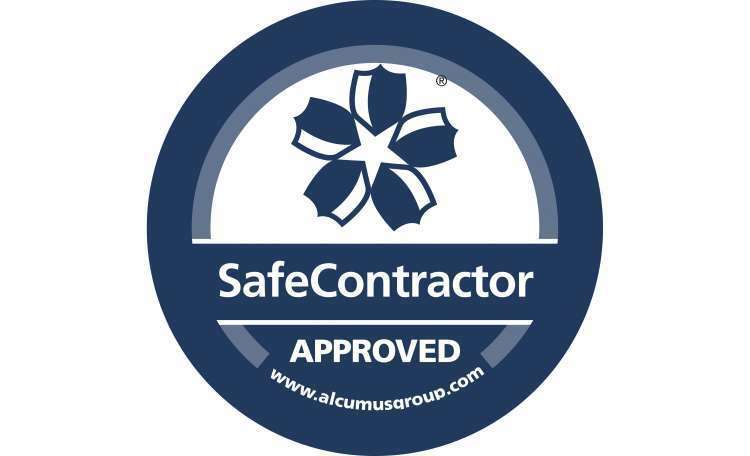 We are approved & accredited members of the most respected standards in our industry.